The Canadian Cancer Society Relay For Life is a community fundraising event where Canadians across the country join together in the fight against cancer. We found these Relay For Life events near you, but if you’re looking for a different location, use the below search options. Search by entering the city and province, or postal code. You can improve your results by adjusting the below radius tool to increase or decrease the search radius. 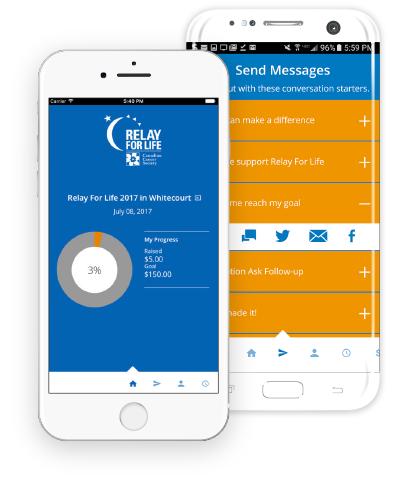 Manage and share your Relay For Life experience on the go with our newly-updated mobile and tablet application. This FREE app lets you fundraise and connect with others through social media and email, update your web pages and check your fundraising progress—all from the palm of your hand.